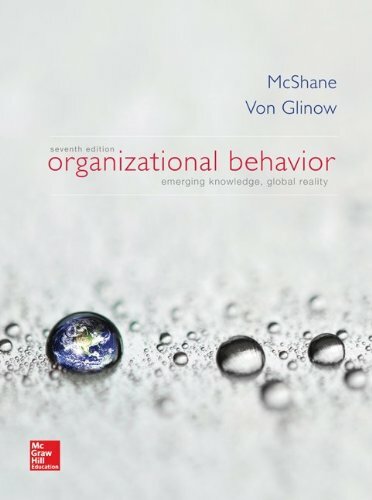 77862589 –Organisational Behavior, 7e by McShane/Von Glinow helps everyone make sense of Organizational Behavior, and provides the conceptual tools to work more effectively in the workplace. This author duo continue the trailblazing innovations that made previous editions of Organizational Behavior recognised and adopted by the new generation organisational behavior (OB) instructor. Textbook&#39s philosophy OB knowledge is for everyone, not just traditional managers. Organisational Behavior, 7e is written in the context of these emerging workplace realities. This edition explains how emotions are the foundation of employee motivation, attitudes, and decisions; how social networks generate power and shape communication patterns; how self-concept influences individual behavior, team cohesion, and leadership; and how adopting a global mindset has become an important employee characteristic in this increasingly interconnected world. This book also presents the reality that organizational behavior is not just for managers; it is relevant and valuable to anyone who works in and around organizations.